Kody Spano Tears ACL; Cody Green Next In Line? Bo Pelini has confirmed that Kody Spano has torn his ACL for the second time on Wednesday in non-contact drills. After the first injury last spring, Spano made an incredible 4 month return just in time for the end of summer workouts. “We have obviously Cody Green and Latravis Washington and we have Taylor Martinez and we brought Ron Kellogg back in,” Pelini said of his back-up QB situation. “We’ll be ok, those guys are all coming along. Although losing Spano will put a dent in the depth chart, his loss isn’t a deal breaker for the 2009 season by any stretch of the imagination – unless Lee gets hurt! Now the million dollar question becomes who is going to be the #2 man behind Lee and ready to lead this offense at the drop of a hat. “We have a true freshman in Cody Green, who’s fairly limited. He had kind of a freak injury during the spring, before spring ball started. Nothing real serious, but it kind of limited him a little bit during spring ball. He’s very talented. We’re excited about his future in the program and what he can bring. Just see how fast he can develop and see how quickly we’d see him on the field. We all know that it’s not going to matter who takes the first snap on September 5th – the bottom line is the cumulative career pass attempts for the entire group of quarterbacks is 2. Everyone’s a rookie at quarterback on this projected Big 12 North Championship team. However, Cody Green must get his chance now. If you remember last season, Terrelle Pryor took the starting Qb job from the veteran and accomplished Todd Boeckmann in a little less than a month into the season and he didn’t arrive on campus until August. I’m by no means saying Green is the same caliber as Pryor. However, if Pryor was ready to lead Ohio State to the Fiesta Bowl, then I firmly believe Cody Green can be ready to lead Nebraska against the Big 12 North if needed. For the coaches to pass up on a very highly touted quarterback in favor of a converted linebacker would shock me, especially when Green has been on campus since last January and has as much experience as Washington with this offense. We must assume from what the coaches are saying that Cody Green is the player they thought they had when they recruited him. Barring any setbacks due to injury, this roster spot has to go to Green, doesn’t it? Shawn Watson: Kody Spano Is 100%; Brandon Kinnie Is Good. Really Good. Nobody gets inside Nebraska football better than HuskerIllustrated’s Sean Callahan, who caught up with Shawn Watson Wednesday night for a little one-on-one. 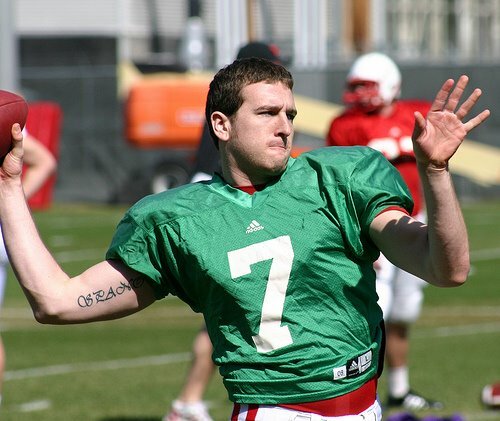 Fall camp is going to get really interesting at the quarterback position behind Zac Lee. As Callahan mentioned, the biggest question other than who gets that #2 spot will be who gets the redshirt – Cody Green or Latravis Washington. With the way things have gone with playing time the previous five seasons, it wouldn’t surprise me in the least to see both Green and Washington redshirt if Spano wins the job. However, Washington looked pretty impressive in the spring game (13/21, 190 yards, 2 TDs), and if Green hit the playbook and gained camaraderie with team, then he certainly has the talent to overtake both players by September 5th. If you aren’t real familiar with Brandon Kinnie, who is 6’3, 215 lbs, and has three seasons of eligibility, here are his recruiting profiles – Rivals & Scout. If Shawn Watson says he’s like Maurice Purify but faster, then I say I’m already in the fan club. You are currently browsing the archives for the Kody Spano category.